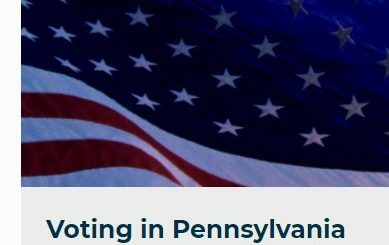 Voter intimidation and discriminatory conduct is illegal under federal and Pennsylvania law. Any activity that threatens, harasses or intimidates voters, including any activity that is intended to, or has the effect of, interfering with any voter’s right to vote, whether it occurs outside the polling place or inside the polling place is illegal. • Election officials are prohibited under federal law including the United States Constitution, the Voting Rights Act, and the Americans with Disabilities Act from discriminating against voters based on race, ethnicity, national origin, language, disability or religion, or from allowing any discriminatory conduct by private actors to affect voters. • Individuals who discriminate against voters can be fined up to $5,000 and face up to five years in prison. • Election officials and private citizens are prohibited from conspiring with others to deprive a voter of her right to vote. • Individuals who conspire to interfere with a person’s right to vote can face up to 10 years in prison. • It is illegal for any person or corporation to directly or indirectly practice intimidation or coercion through the use of force, violence, restraint, or infliction or threatened infliction of injury, damage, harm, or loss, in order to induce or compel a person to vote or refrain from voting for a particular candidate or on a particular political issue. • It is illegal for a person or corporation to use abduction, duress, coercion, or any other forcible or fraudulent means to impede, prevent or otherwise interfere with a person’s right to vote. • No election official may knowingly refuse the vote of a registered voter. • Individuals who intimidate voters can be fined up to $5,000 and face up to two years in prison. • Aggressive behavior inside or outside the polling place. • Blocking the entrance to the polling place. • Challenges to voters based on the voter’s lack of eligibility to register to vote. • Direct confrontation or questioning of voters, or asking voters for documentation when none is required. • Disrupting voting lines inside or outside of the polling place. • Disseminating false or misleading election information. • Election workers treating voters differently in any way based on race or other protected characteristics. • Ostentatious showing of weapons. • Photographing or videotaping voters to intimidate them. • Poll watchers confronting, hovering or directly speaking to voters. • Routine and frivolous challenges to voters by election workers and private citizens that are made without a stated good faith basis. • Using raised voices, insulting offensive or threatening language, or making taunting chants inside the polling place. • Vandalism of polling places. • Verbal or physical confrontation of voters by persons dressed in official-looking uniforms. • Violence or using the threat of violence to interfere with a person’s right to vote. • Individuals who witness voter intimidation or who are victims of voter intimidation should report the incident to their County Board of Elections and County District Attorney. • Each County Commission is required to investigate alleged violations and report them to the District Attorney, who has the authority to prosecute such violations.